Fleet Xpress opens up new levels of connectivity and exceptional performance across the world's oceans. Delivering greater bandwidth, seamless mobility and outstanding reliability, wherever you operate in the world. Every Fleet Xpress shipboard solution utilises both a Global Xpress Ka-band and a FleetBroadband L-band terminal, delivering high data speeds in a reliable managed service, controlled by an onboard Network Service Device (NSD). 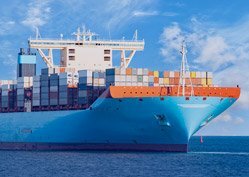 With a wide range of new applications, ship owners and managers can transform the way shipping operates, with real benefits in operational efficiency, safety and compliance, cyber security and crew welfare. Crew benefit from access to regular voice and video calls with friends and family, together with the ability to access sport and news, shop online and use social media via their smartphones, tablets and laptops. Fleet Xpress is offered globally through the Inmarsat-5 and Inmarsat-4 (plus AlphaSat) global satellite network. Inmarsat-5 coverage is provided by three Ka-band geostationary satellites located in the Indian Ocean Region (IOR) at 62.6° East, Atlantic Ocean Region (AOR) at 54° West and Pacific Ocean Region (POR) at 178° East. illustrates the complete Fleet Xpress network including satellite footprint, Satellite Access Stations (SAS) and Meet Me Points (MMP). 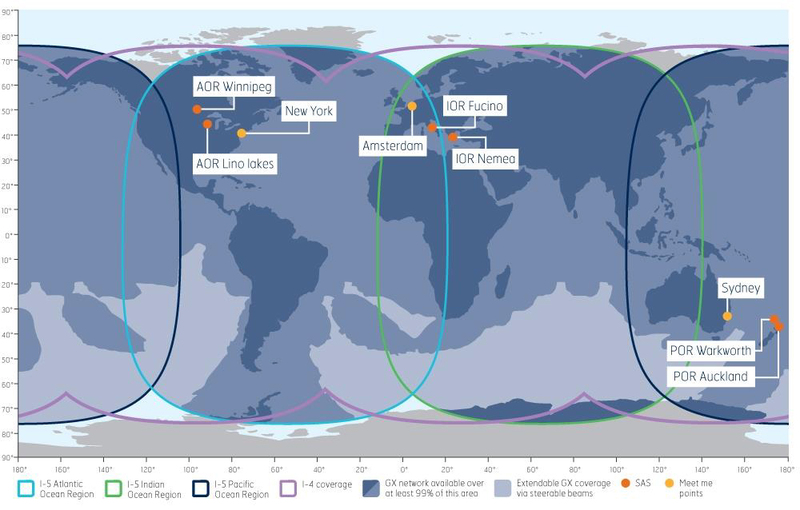 This map depicts Inmarsat's expectations of coverage, but does not represent a guarantee of service. The availability ofservice at the edge of coverage areas fluctuates depending on various conditions. Fleet Xpress coverage 2016. 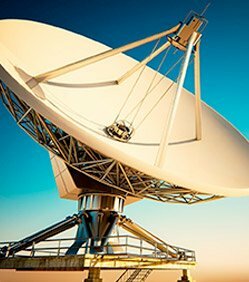 The Fleet Xpress Ka-band solution comes with a unique dual teleport design with two separate SAS (Satellite Access Stations) per satellite. The SAS sites are fully redundant backup of each other, in physically separate locations, generally hundreds of miles apart chosen due to them being situated in different climate zones. 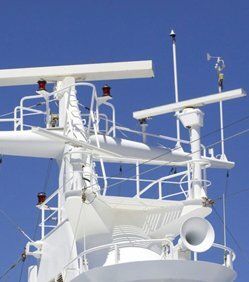 This design which automatically switches between SAS allows Inmarsat to minimize outages caused by weather or maintenance. This unique feature of a dual teleport design virtually eliminates outages caused on the teleport. The Fleet Xpress Service includes usage of the FleetBroadband Satellite constellation (Inmarsat-4 + Alphasat) for backup connectivity when the Ka-band service component (GX) is not available. The switchover between the Ka-band service component and the Lband service component is controlled on the vessel by an INSD and is managed by Inmarsat. 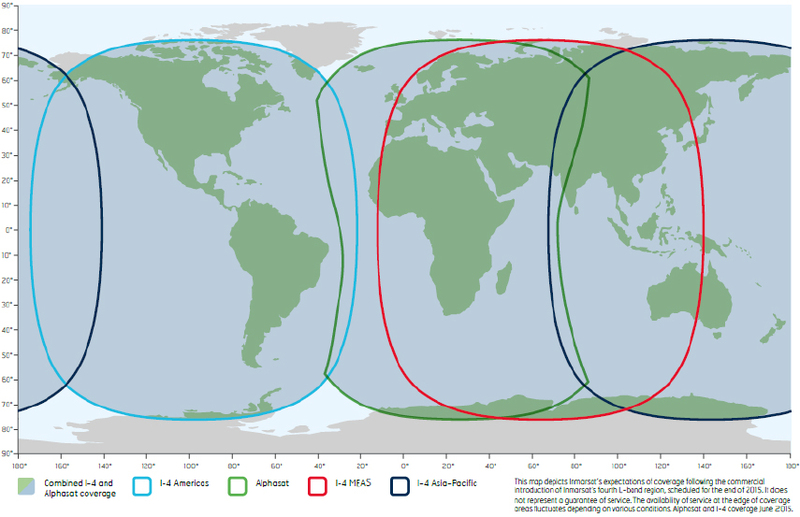 The Inmarsat-4 constellation and Alphasat coverage is shown in . As part of the Fleet Xpress retail service, all data traffic is routed to a preselected Home POP where the Internet breakout is located. The POPs are in Amsterdam, Sydney and New York. 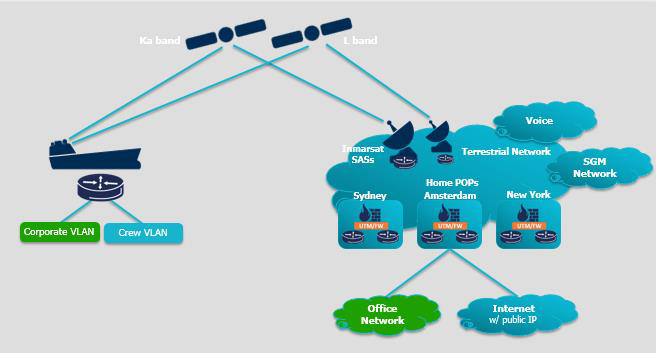 The Home POP is an option selected by the customer prior to activation to provide advanced security functionality, and possibilities for office-vessel connectivity which is a service called 'Business Access'. In addition, the Home POPs also facilitate seamless routing of traffic as service switches between the Primary Ka-band and Secondary L band services. A customer can select both these services in the Service Activation Order Form document during the presales process. Fleet Xpress offers 3 separate and fully routed networks all the way from the ship to the selected Home POP. The routing is done via a combination of technologies, such as 3 separate Synthetic Virtual Networks (SVNs) on GX and 3 separate Packet Data Protocol (PDP) Contexts on FleetBroadband. The 3 separate networks are called Corporate LAN, Crew LAN and Voice plus Management LAN. The same IP range is maintained for the vessel independent on being on GX or FleetBroadband. When operating on the primary GX service link Fleet Xpress service utilise three SVNs which are employed to logically separate groups of traffic with similar traffic profiles; Fleet Xpress service with the INSD utilises three separate SVNs over the Ka network only. The Cisco router rack unit (RU) on the vessel manages the separate SVNs and assigns them to a specific VLAN. Over Ka-band, SVN 1012 allows the vessels voice services to connect to the MPLS Voice cloud (Ka Only) whilst leveraging bandwidth that is independent from the customer's bandwidth. This is a tremendous advantage as the Crew and Corporate LANs are dedicated to data traffic only, whilst voice is routed through a separate dedicated pipe with distinct QoS. In addition, SVN 1012 connects to Inmarsat's Network Management System (also known as NMS) to facilitate remote management and monitoring of all the FX systems on board the vessel. SVN 1013 provides a fully routed connection from the Corporate VLAN on the vessel to the Internet or Business Access breakout at one of the Home POPs. There exists the option for a public IP address (IP vs.4) to be assigned to the Corporate Network which has a one to one mapping to a private IP on the corporate subnet. Using DHCP, the Cisco router rack unit allocates Private IP address to devices on the Corporate LAN via 1Gbps Ethernet RJ45 (1000Base-T). 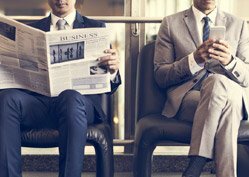 The selection of a Public IP satisfies the frequent market requirement for remote access. This SVN provides a fully routed connection from the Crew Network to the Internet via the POPs. The Cisco Router RU assigns IPs using DHCP to devices on the Crew Subnet interfaced via RJ45 Ethernet.